During most winters we can count on Winston-Salem being pretty mild. We may get some freezing days, but we don’t usually get a long cold spell. Well, that certainly was not the case in December when we had many single digit days. Hopefully your heating system kept you warm. But if it didn’t, it is probably time to contact an HVAC Winston Salem company. If your HVAC system is not keeping you warm, something is wrong. Professionals can diagnose the issue and then make the necessary repairs. You need to call a local company that can respond quickly in cold weather. Sometimes repairs are not enough for an HVAC system. If your system is old or not in great shape, you may need a replacement. A good HVAC Winston Salem company will make sure you get the right one for your home. In order to run well, an HVAC needs regular maintenance. This involves periodic tune-ups and inspections to catch potential issues before they can become big problems. You just never know when an HVAC system will stop working. It could be in the middle of the night or during a holiday. 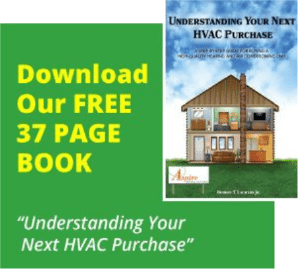 A reputable HVAC company will be able to help you out no matter when you need them. Your heating system is something you never want to work on yourself or ignore. If yours is giving you trouble, just get in touch with Aspire. We will gladly send someone out to your home to give you a free consultation. We offer maintenance plans as well as financing options. Spring may be just a couple of months off, but we will still be in for some cold days and even colder nights. Contact us today.